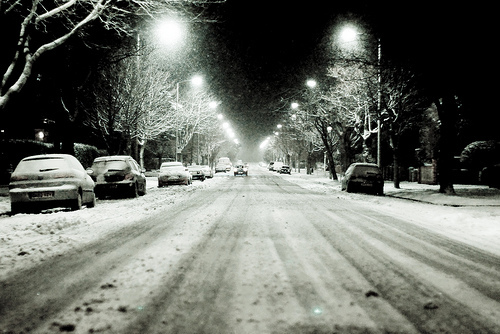 Changeable winter weather conditions in the UK leave millions of motorists stranded every year. Many people fail to prepare for severe weather and this causes major problems. 1. Be safe - Consider if your journey is necessary. Check the local and national weather forecasts before you set off. Where possible do not travel. If you feel you need to travel, set off as early as possible. Tell someone at your destination what time you expect to arrive. 2. Plan ahead - Plan your route with the TomTom Via LIVE 125 Sat Nav. This great 5” touch screen sat nav features UK, ROI and full Europe mapping. It also provides accurate traffic information with TomTom HD Traffic and comes with enhanced driving features, including full Voice Control, hands-free call answering as standard & spoken street names. It also has advanced lane guidance, letting you know exactly which lane you are supposed to be in, combined with IQ routes the Via function will accurately calculate your journey length based on real speed data collected from other TomTom users. Save £100 as it’s now £199.99. 3. Pump it up! - Check your tyres tread regularly along with your tyre pressure. Both can make all the difference when travelling in difficult conditions. Pick up a tyre pressure gauge from Halfords for as little a £5.99. 4. Emergency kit - carry an extra winter pack in addition to your usual emergency equipment. Try the AA Winter Kit priced at £19.99 as it contains a wind up torch, foldable shovel, blanket and high visibility vest. 5. Be prepared - Make sure you have extra clothing, a blanket, drinks, food, snow shovel, and Halfords Snow and Ice Grips for your shoes priced at £19.99, to make life easier should you get caught out in the cold. 6. Keep it clean - Make sure your screen wash is topped up to maintain visibility and prevent spray from freezing on the windscreen. Try Halfords Premium Ready Mix Screenwash, priced £5.99 for 5 litres*. 7. Keep your cool – Check you coolant levels regularly to ensure you don’t suffer any problems. Use the anti-freeze tester from Halfords, priced £1.99 to check your levels. Top up with Halfords Anti-Freeze and summer Coolant, priced from just £5.99 for 1 litre. 8. Charge your batteries – Make sure you have no problems starting off. Keep your battery fully charged with the Halfords Fully Auto Battery Charger priced at £39.99. Alternatively if a new battery is required, Halfords has a wide range starting from as little as £54.99. Halfords also offer a fitting service on batteries from £4.99. 9. De-frost - Remove all snow and ice from your vehicle before you set off. For minimum effort in the cold, try Halfords Night Before De-icer. Priced just £2.99 for 500ml, it works while you sleep to keep your screen clear of ice for the morning. 10. Easy does it - Drive conservatively, and watch out for compacted snow. Avoid any sudden moves or sharp braking. Also watch out for Gritters. They are a good indication that ice is forecast for the following day in a particular area. Your tyres will also appear quieter when travelling on ice so listen carefully.